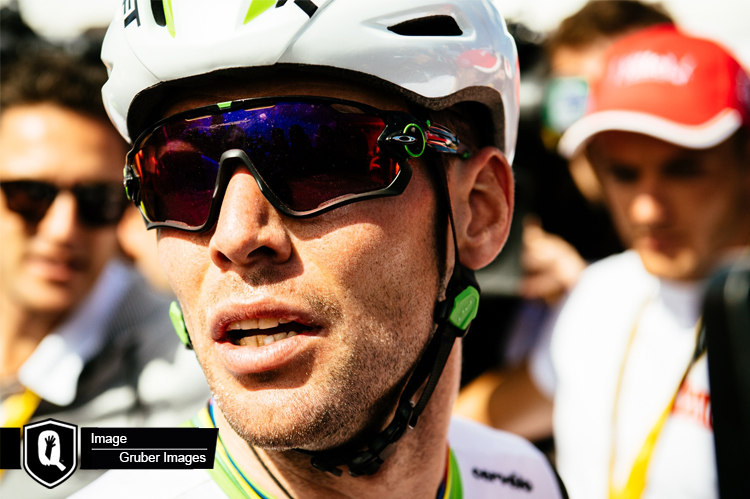 Team Dimension Data for Qhubeka finished off this year’s Tour de France with another podium performance by Edvald Boasson Hagen who sprinted to third place on the final stage of the race. Per tradition, the day started out with smiles and laughter as the riders left Montgeron and headed towards Paris. However, as the peloton entered the iconic circuit on Champs-Élysées, the faces of the riders were now very focused and ready to race hard. Multiple riders tried to escape as they started on the eight laps and ultimately, a strong group managed to distance the peloton. Jaco Venter and Steve Cummings helped to set the pace in the pack and with 10 km left to go, it was all back together again. The remaining Team Dimension Data for Qhubeka riders always kept Boasson Hagen near the front and together with Reinardt Janse van Rensburg, the fast Norwegian entered the final corners in a good position. Dylan Groenewegen (Team LottoNL-Jumbo) started his sprint early and quickly opened up a small gap. Boasson Hagen tried to close the gap but at the end, he had to settle for third place. In addition to his impressive victory on stage 19, this was the fifth time Boasson Hagen finished in Top3 during this Tour de France. Bei den 28. Deutschen Cross-Country-Meisterschaften wird am Wochenende in Bad Salzdetfurth die Rekordzahl von 15 Titeln vergeben. Bei den Damen haben gleich drei Damen gleichwertige Chancen auf das Meister-Jersey, bei den Herren gilt am Sonntag Manuel Fumic als Favorit. Eröffnet wird die DM am Freitag mit dem Eliminator Sprint. Er hatte als Meister anstatt dem weißen auch schon ein schwarzes Jersey mit schwarz-rot-goldenen Brustringen getragen. Fumic holt aber auch noch die Analogie zum DFB-Pokal aus der Kiste mit den Rennfahrer-Weisheiten. „Meisterschaften haben ihre eigenen Gesetze“, sagt der Kirchheimer. Diese eigenen Gesetze beruhen darauf, dass seine Konkurrenten – im Gegensatz zum Weltcup – neben ihm in der ersten Reihe aufgestellt werden. Es im Unterschied zu den großen Rennen also gleich mal zu direkten Auseinandersetzungen kommt. Das verändert die Ausgangssituation auf jeden Fall. Ob es auch die Hierarchie verändert, wird sich zeigen. Tour de France #19: Edvald Boasson Hagen powers to victory! Team Dimension Data for Qhubeka’s Edvald Boasson Hagen crowned an incredible performance by soloing to victory after a powerful attack on the final kilometers on stage 19 of Tour de France. Knowing that today’s stage was the last chance for the opportunistic riders to shine in the race, it was no surprise to see countless attacks during the first part of the stage. It took nearly an hour of hard racing before a group of 20 riders finally managed to distance the peloton. Team Dimension Data for Qhubeka performed a great leadout for Edvald Boasson Hagen who did very well to make podium as he sprinted to third place on stage 11 of Tour de France. Once again, the early break got away right from the beginning of the day. This time, three riders decided to take on the peloton, which didn’t seem too concerned about the situation. The front trio quickly established a gap of four minutes before the pack started to chase. With several teams eager to take control of the peloton, the break wasn’t left many chances of succeeding. However, one of the riders at the front, Maciej Bodnar (BORA-hansgrohe), almost managed to upset the expected bunch sprint. Bei großer Wärme wurde die Flachetappe über 213km ausgetragen. Der Etappenverlauf war ähnlich wie am Vortag, die obligatorische Fluchtgruppe wurde kurz vor dem Ziel wieder eingeholt. Danach gab es ein faszinierendes Sprintfinale mit sehr hoher Geschwindigkeit, da auf der Zielgeraden Rückenwind herrschte. 2 Teams gelang es bis 400 Meter vor dem Ziel ihre Kapitäne in eine optimale Position zu bringen, Quickstep mit Marcel Kittel und Dimension Data mit Edvald Boasson Hagen. Am besten gelang die Sprintvorbereitung Dimension Data und Hagen konnte seinen Sprint perfekt platzieren, obwohl solche schnellen und flachen Ankünfte eigentlich nicht seine Spezialität sind. Edvald Boasson Hagen made it a hatrick of stage victories and won the final stage of the Tour des Fjords and with it, the overall general classification as well. Timo Roosen (LottoNL-Jumbo) was 2nd on the final stage and Jereon Meijers (Roompot) placed 3rd. The final stage of the Tour des Fjords got underway in the pouring rain and cold but the racing got heated really early on. 4 riders got away in an early move but as the wind picked up, the peloton was forced into the gutter and the echelons formed. With 100km to go, the break was caught with the race splitting to pieces. Team Dimension Data for Qhubeka was relishing the tough conditions, keeping Boasson Hagen well placed up at the front. After sprinting to victory yesterday, Edvald Boasson Hagen doubled up to win stage 4 of the Tour des Fjords today. Our Team Dimension Data for Qhubeka rider beat Torkhil Feyhe (ColoQuick-Cult) to the line and Andrea Pasqualon (Wanty Groupe Gobert) finished 3rd. Team Dimension Data for Qhubeka started today’s stage with a clear plan to gain back time on the overall classification and this was evident as we controlled the peloton for the first 30km, not allowing a break to get away until after the bonus sprint. Boasson Hagen won the bonus sprint to gain 3 seconds on the overall classification and only then, was a 3 rider break allowed to go clear. The break got up to a 7-minute lead before we committed our African Team to the chase. It was no surprise that no other teams wanted to help with the chase but our guys did a fantastic job to slowly reel in the escape over the 162km stage. Coming into the final, the peloton was split all over the final circuit, as we chased down the remaining breakaway rider with 5km to go.